In our next ‘Photo of the week’ we are looking at research investigating ways in which to help improve uptake of maternity care in rural Nepal. The research is being led by BU’s Professor Edwin van Teijlingen. 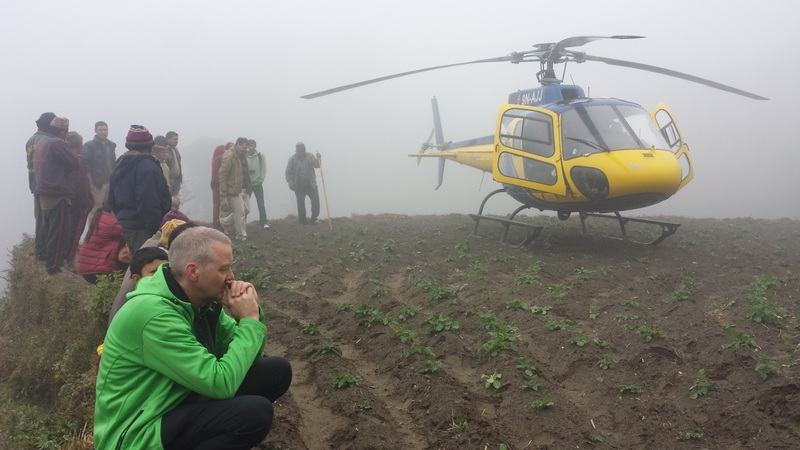 Fieldwork does not always go to plan, especially not in a low-income country such as Nepal. This picture was taken near a remote mountain village in Dhading in January 2015. Professor van Teijlingen and his team had arrived there two nights earlier in unusually bad weather for the season. The drive up the mountain in an old 4×4 from the main road had taken nearly six hours over steep muddy roads and through knee-deep rivers. The second day, after meeting local health post staff we were prevented from leaving as torrential overnight rain had made the mountain roads very dangerous. Our fieldwork focuses on improving the uptake of maternity care in rural Nepal. Professor van Teijlingen and his colleagues have published over 60 papers health, health promotion and health care research in Nepal over the past decade. Bournemouth University has been involved in evaluating health promotion intervention projects to help build research evidence to help promote evidence-based practice in Nepal. The maternity care research is supported by ‘Green Tara, UK’, a London-based Buddhist charity. This picture shows BU Professor Edwin van Teijlingen waiting for the sky to clear to allow the helicopter to take-off. The picture was taken by BU Visiting Faculty Dr. Bibha Simkhada.